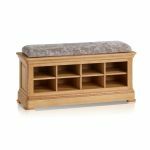 Take back control of your hallway with the Canterbury shoe bench. 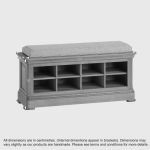 Eight storage cubbyholes hold shoes, or other hall clutter. 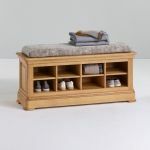 The cushioned top is a comfy spot while you change your shoes, or supervise younger people’s shoe to slipper change. With its rounded corners and natural oak finish, the shoe bench could even be used as a window seat, or storage unit in another room. 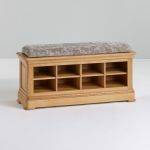 Very versatile, and the cushion is available in a choice of five colours. 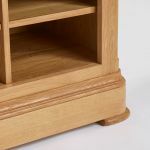 This remarkable shoe storage piece also forms the base of a hallway stand (available separately), if you wish to hang coats and hats.